Common symptoms of adrenal fatigue are extreme fatigue most of the time, feeling overwhelmed, salty food cravings, depression, anxiety, headaches, insomnia, low libido, and allergies. Proper amount of sleep, exercise, prayer & meditation, deep breathing, improving your diet, cutting down on caffeine and sugar are just some changes that can improve the adrenal system. 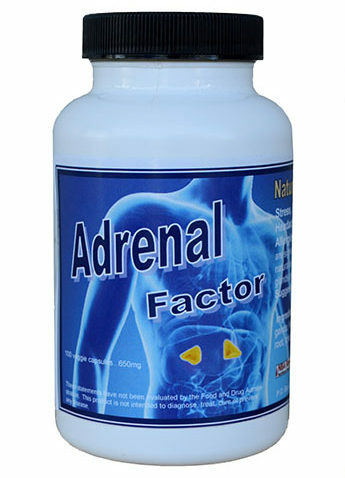 The Adrenal Factor product was designed to support healthy adrenal functions. Each ingredient was researched and shown to aid in aiding adrenal functions. Rhodiola is considered an adaptogenic herb, meaning that it acts in non-specific ways to increase resistance to stress, without disturbing normal biological functions. The American Botanical Council, reported that numerous studies of rhodiola in both humans and animals have indicated that it helps prevent fatigue, stress, and the damaging effects of oxygen deprivation. Evidence also suggests that it acts as an antioxidant, enhances immune system function, and can increase sexual energy. Maca Root is an adaptogen and a member of the cruciferous family, like broccoli and cabbage, but due to it’s unique properties it considered one of the world’s natural “super foods. Benefits are increased fertility in both men and women, hormone balance, booster for the immune system, and increased energy, stamina, improved sexual function, memory, and focus. Ashwagandha One of the most incredible aspects about adaptogenic herbs like ashwagandha is that it can help people with both hypo and hyper thyroid issues. It has been shown to support a sluggish thyroid for people diagnosed with Hashimotos, and has been shown to improve the health of those with an overactive thyroid or Graves disease. Improve thyroid function, treat adrenal fatigue, reduce anxiety and depression, combat effects of stress, Increase stamina and endurance, stabilize blood sugar and boost immunity. Korean Red Ginseng Many studies have indicated that Korean Red Ginseng has several benefits such as: Improves mood and reduces stress, improves brain function, has anti-inflammatory properties, supports healthy sexual functions, lowers blood sugar levels, and boost the immune system. Astragulas In Traditional Chinese Medicine, the herb was hailed as a protector against stresses, both mental and physical. Astragalus provides health benefits to a number of body systems and ailments. Astragalus has been used for centuries in traditional Chinese medicine. It is a powerful adaptogenic herb and is said to support immune function. Astragalus contains an enzyme called telomerase which stimulates the production of telomeres. Every time DNA replicates, the telomeres get slightly shorter and eventually when they get small enough, the process of cell death begins. Research has linked this process of cell death to aging. The production of telomeres is believed to slow the aging process considerably. Astragalus reduces the amount of nitric oxide released from cells, which reduces inflammation. Also activates genes and pathways which activate different immune cells. Suma Root is considered an adaptogen, a substance that strengthens and protects the body and mind against stress. Suma is packed with nutritional value. It contains many vitamins, minerals and amino acids. Most importantly, it contains germanium, a potent immune system booster. It also contains saponins, just like ginseng does. Chuchuhuasi is reported to increase cognitive function and improve general well-being. On top of working to improve things like memory and energy levels, Chuchuhuasi was also found to be a powerful muscle relaxant. Relaxing the tension in muscles is one of the ways the extract is able to relieve pain in users. Camu Camu has the highest level of vitamin C on the plant. It can have 60 times more vitamin C than an orange and 56 times more than a lemon! Vitamin C has been found to be a powerful immune system booster. Camu Camu helps feed the body the necessary nutrients it needs to properly detoxify. Camu camu’s high levels of vitamin C can help your brain produce more serotonin, which will enhance your mood — and it’s why camu camu can be a potential remedy for depression. These eight ingredients make for a very powerful supplement that supports healthy adrenal activity.